After reading Mike Rohde's Sketchnote Handbook last month, I set myself a challenge to record a 2 day conference with Sketchnotes. It was to be the AgileAus18 conference in Melbourne on 18/19 June 2018. Little did I know that Ben Crothers had recruited an army of student sketchnoters. I posted a sketch immediately following every talk, using the conference app. The notes were popular, with over 400 interactions on the posts over 2 days. By the end of Day 1, I had gained notoriety amongst the student sketchnoters as "The Imposter". Now, you should definitely check out of the work of the other Sketchnoters. It was a huge movement! My hand was cramping out by the end of Day 1. The ink on my felt pen ran out after morning tea on Day 2. And by mid-day on Day 2, I think I had hit the mental brick wall. I was tempted to wing it, but I'd come this far, so I stuck to the cause! 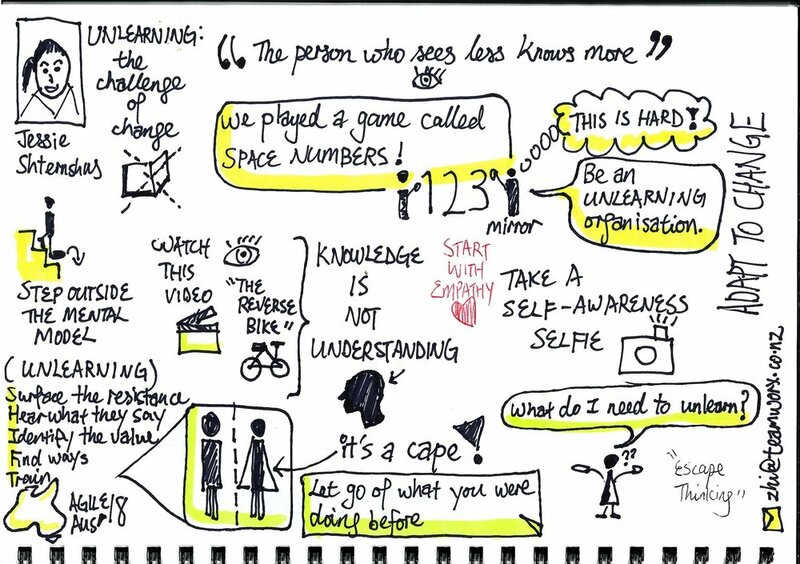 See the full collection of Zhi's sketchnotes on LinkedIn, and read more about this team of sketchnoters at AgileAus18 in Ben Crother's article, and say hello to Zhi on Twitter.